Want to satisfy those late night cravings for something savoury? Then you have to try this. 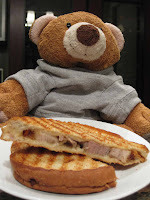 It is simple to make if you just happen to have a panini press and some fatty roast pork and applesauce on hand. YUM.